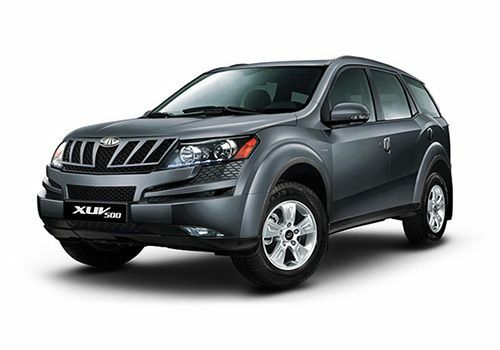 Mahindra and Mahindra, India's largest SUV manufacturer has silently launched the 'Xclusive Edition' of its premium sports utility vehicle XUV500. This latest variant is powered by the same fifth generation 2.2-litre mHawk diesel engine that is mated to a six speed manual transmission gearbox. This Mahindra XUV500 Xclusive Edition gets exclusive set of features inside the cabin that makes it even desirable in this segment. The list of additional features include illuminated scuff plates, six way power adjustable driver's seat, a convenient rear view camera, 'Xclusive' badge on its tailgate and sporty aluminum pedals. The manufacturer is also offering a new set of stylish grey alloy wheels, which renders it an astounding look. Furthermore, this SUV is now blessed with an electric sunroof, which certainly provides a feel of ultra-luxury. On the other hand, there are no cosmetic updates given to its exteriors or interiors. Its front facade gets the signature radiator grille with perforated mesh and is surrounded by projector headlamps. While the interiors gets an attractive color scheme and is decorated with metallic accents. There are only 700 units of this SUV are produced, which will be available until the stocks last. Like mentioned above, this latest edition has not got much of updates to its exteriors, but there are a lot of black accents given all round the body. Its front facade is fitted with a wide headlight cluster with black finish inside. It houses projector headlamps along with LED parking lights and turn indicators. In the center, the radiator grille gets vertically positioned strips sitting on the perforated mesh. At the same time, it is also decorated with chrome plated company's insignia, which gives it a majestic stance. Like its grille, its front bumper too has a rugged design, but has a small air intake section. It is also fitted with a black colored lower cladding that adds to its sporty appeal. One can also see the black accents on its fenders, ski racks along with B, C and D pillars. Its wheel arches are now fitted with newly designed alloy wheels, which have grey finish. While the door handles along with ORVM caps are done up in body color. Coming to the rear, its entire design remains similar to its existing variant. However, its tailgate is now affixed with 'Xclusive' badge that emphasizes its exclusivity. Like its front and side facets, its rear rear bumper too gets black protective strips. The main attraction of its rear is its taillight cluster that houses LED-like brake lights and turn indicators. Coming to the interiors, this newly introduced Mahindra XUV500 Xclusive Edition gets an attractive beige color scheme, which is decorated with metallic accents. This vehicle is now blessed with an electric sunroof, which is further integrated with a smart anti-pinch function. Its center console looks small, but it is done up with an attractive brown color scheme. The dashboard also houses a twin-pod instrument cluster featuring two round shaped analogue meters and a multi-functional display. This trim also gets exclusive features like aluminum pedals along with illuminated scuff plates, which provides a sporty appeal to the cabin. On the other hand, buyers can now opt for an electrically adjustable that can be adjusted in six different ways. Apart from this, the manufacturer is also offering a few additional aspects like voice messaging system and driver's side window with anti-pinch function. This variant is powered by a 2.2-litre mHawk diesel engine under the hood, which comes with a displacement capacity of 2179cc. It is equipped with 5th generation variable turbocharger and micro hybrid technology, which enhances its performance. It has the capacity of churning out a maximum power of 140bhp at 3750rpm in combination with a peak torque output of 330Nm between 1600 to 2800rpm. It is cleverly mated with a six speed manual transmission gear box, which allows the SUV to attain a top speed in the range of 180 to 185 Kmph. It is incorporated with a common rail based direct injection fuel supply system. It enables the vehicle to generate 12 Kmpl approximately in the city traffic conditions, while its mileage goes up to 15.5 Kmpl on the bigger roads. The company has given this vehicle a proficient braking and independent suspension mechanism, which makes it capable for off-roading. Its all wheels are equipped with a set of disc brakes with calipers. This mechanism is further augmented by anti lock braking system along with electronic brake force distribution. It also has ESP with rollover mitigation. On the other hand, the front axle is assembled with McPherson strut, while rear axle is equipped with multi link type of mechanism. Both these axles are assisted by anti roll bar. It is incorporated with a responsive power steering system, which is speed sensitive. This steering wheel is tilt adjustable and supports a minimum turning radius of 5.6 meters. This Honda XUV500 Xclusive Edition variant is incorporated with a number of highly developed comfort features, which gives the occupants an enjoyable driving experience. It is bestowed with an advanced 2-DIN audio system with 6-inch touchscreen display, which supports GPS navigation. This music system supports CD/DVD player, USB interface, Aux-in port and speakers, which further enhances the ambiance of its cabin. It also has Bluetooth connectivity for pairing mobile phones. The printed glass antenna is also given for better reception of FM radio. The company has given it a multi-functional steering wheel, which is mounted with audio call and call control buttons. It is bestowed with fully automatic temperature control unit, which also has rear AC vents for cooling the entire cabin quickly. The cruise control system maintain a steady speed on the highways as set by the driver. Apart from these, the cabin is incorporated with all four power windows with driver side auto down function, remote tail gate opener, flip key with remote central locking, conversation mirror, mobile charging points and lots of others. This sports utility vehicle is equipped with a number of protective aspects, which keeps the vehicle as well as passengers safe. It is bestowed with airbags for driver and front co-passengers along with side and curtain airbags, which minimizes the impact of collision. The anti lock braking system along with electronic brake force distribution, which prevents it from skidding. It also has electronic stability program with rollover mitigation, which is added advantage. Its rigid body structure comes with crumple zones and impact beams that ensures the safety of the occupants sitting inside the cabin. Its all wheels are equipped with a set of disc brakes that de-accelerates the vehicle instantly. Its high intensity headlamps enhances the road safety by providing a clear view to the driver. The advanced engine immobilizer is quite useful, which helps in preventing unauthorized entry into the vehicle. Apart from these, it also has a high mount stop lamp, a pair of front fog lamps, centrally located fuel tank, central locking system, rear view camera and many other such aspects. 1. Addition of an electric sunroof is a big plus point. 2. Spacious internal cabin with ample leg space and head room. 1. Too big in size makes it slightly difficult for maneuvering in heavy traffic. 2. Fuel efficiency is not up to the mark.